Hobby sewist enjoying escapist fabric addiction. I finally get to post about the finished project. I made "Nelson" over Christmas and he came out pretty good. 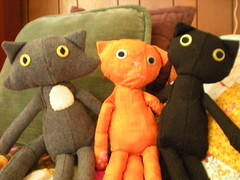 The challenge was that sewing a replica of an all black cat means that in the end you sew an all black stuffed animal. Compared to Bud or Bear he doesn't have many defining features other than those piercing yellow eyes. But that's kind-of the way it goes in real life with him. Maybe I can implant a little voice recorder that makes his characteristic high pitched meow and then the experience would be complete! Lucy in her prairie dress! This was the big success this Christmas as far as I was concerned. My mom and sister got in on it and we put together a "traveling trunk" that would have been for Laura in Little House on the Prairie (my nieces favorite story). The bonnet was a little more challenging than the dress, just because of gathering and visible seams, but on the whole I think they both came out pretty good. 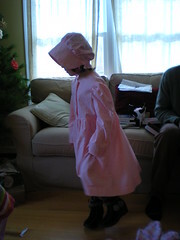 At first she refused to wear it and I was never quite clear on the reason, but after some negotiation with her mother she put it on and seemed to enjoy it. Ha!